Muse101: Who Is Thalia, Muse of Comedy? I have many sisters. That may not be what you were taught in school, unless you went to a very enlightened establishment. If you did not go to a very enlightened establishment, you may be asking even now, "Wot th' bleedin' 'ell is a MUSE?" Or words to that effect. All of humanity shares a Collective Unconscious. Which means that each of you is about as unconscious as the next one, but the collectors (of BMW's and other toys) are more so. It also means that all of you are linked at a basic level, like the basements in a block of townhouses. Down here in the basement are Archetypes, images and personifications of age-old, universal ideas -- like Birth, Death, and Very Good Beer. Which means we Archetypes control the heating vents and the water pipes. Also the power switches. Muses are Archetypal figures who stimulate various forms of creative writing. We each have a specialty. My Assignment is nurturing Comedy. The Greeks defined Comedy as any story with a happy ending. In the Tweny-First Century, it's any humorous entertainment (and some that are only trying) (and some that are very trying). I encourage both happy endings and humor. I especially encourage parody, satire, and lawyer jokes. You can guess what drew my attention to Seattle. Usually my sisters and I are pretty subtle about our Musing, but every few centuries or so a woman needs to party. A lot of the people I love are active here. So I'm going to mingle with the crowd at the Speakeasy computer-cafe here, or wherever, and be just a little more overt than I have in the past. These Nine Muses have still older Relatives. "The sons of Aloeus held that the Muses were three in number, and gave them the names of Melete (Practice), Mneme (Memory) and Aoede (Song)." 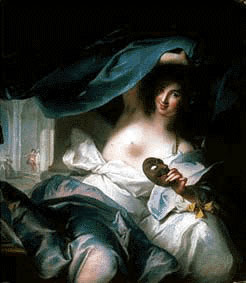 Mneme, under the name Mnemosyne, was the mother of the Nine Muses, according to Pierus. Zeus was the father. Zeus's wife was named Hera. This may be why we don't hear much more about Mnemosyne. There are still more Muses; some overlooked in the original listings (like Cindy, Muse of Other) and others even now being born. I'm not even going to get into their genealogy. The Muses can bestow the gift of talent and insight. They can also revoke their blessings. One story says that a singer and poet named Thamyris challenged the Muses. He mocked them and made light of their skills. For his insolence, Thamyris was maimed and lost his memory. He could no longer remember his songs, his poems, or where he left his drinking jug. The moral of this story is left as an exercise for the reader. The Muses are also called the Graces, as when they attend the festivals on Olympus and entertain and inspire the other gods with their wit and charm. Apollo puts aside his bow and plays the lyre as the Graces join in the dance of the immortals. All of the Archetypes have many different physical manifestations. Some of the Goddess renderings I'm especially fond of, myself, are those of Jonathon Bowser. As of my last appearance in Ghostletters, I am 5'2", 36-24-36, very Greek-featured, with lots of long black curly hair. I have developed a fondness for Guinness Stout and Irish musicians, and I can go through quite a lot of both. Just letting you know.